...we have seized lightning from the skies, but what lies just below us, the earth upon which we tread, where we live and die, is still largely a mystery to us. God forgive my presumption, but I yearn to raise this dark veil, though more vigorous hands than mine have perished and been forced to recognise their impotence. The observatory —now, officially, the Vesuvius Observatory, Naples Section of the National Institute of Geophysics and Volcanology— is quite visible on the western slopes of Vesuvius. It rests on Colle del Salvatore, a knoll (image, left), putting it out of the range of ejecta and in a position where lava from an eruption will be channeled around the observatory and not through and over it. It is the oldest such institution in Italy and is still an active institution for important research in geophysics and vulcanology. 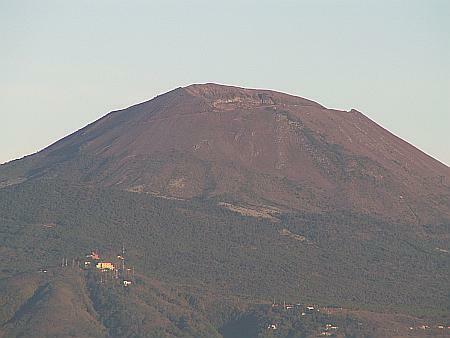 The observatory is responsible for monitoring the volcano it rest upon as well as keeping tabs on other geological happenings in the area, such as those involving the nearby Flegrean Fields and the island of Ischia. In 1970 the original building was relegated to the role of museum, exhibit hall, and library, and a new building was constructed to meet the needs of modern science. Directors of the observatory have included perhaps the best-known Italian geologist, Giuseppe Mercali (director from 1911-14), among whose achievements was the descriptive system used to classify earthquakes according to perceived effect on the environment (a system since superseded in most places by the Richter and later scales, which measure the amount of energy released by a quake). restoration by Tana A. Churan-Davis. ...there is a shift system to ensure that two staff members are always on duty at the Vesuvius Observatory. These operators are responsible for checking seismic developments of the Campania volcanic areas...and for communicating to the authorities any significant phenomena observed by the seismic monitoring system, under permanent observation. This is good to know since hundreds of thousands of people live in the immediate area described as the "Red Zone", the area that will have to be evacuated when (not if) the time comes. A recent report from 32nd World Geological Conference in Florence essentially said that an explosive eruption (not a slow, effusive, what-a-lovely-lava-flow! eruption, but a true explosion) was just a matter of time. The report described Vesuvius as the world's most dangerous volcano and warned that by 2100, Mount Vesuvius will certainly repeat its most dramatic performance, the infamous eruption of 79 A.D., which buried Pompeii. 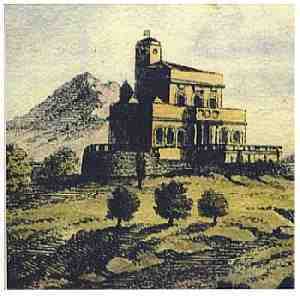 Dramatic moments in the history of the Vesuvius observatory have included an episode in 1872 in which director, Luigi Palmieri, stayed at his post during a large eruption in order to make accurate observations. That eruption killed a group of students taken by surprise by a sudden burst from a cone on the northwest slope. Palmieri stayed while the lava flowed dangerously close. He survived and continued to edit his Vesuvius Observatory Annals, a prestigious journal that he founded and edited until his death in 1896. There was a powerful eruption in April, 1906 and one in 1944 (photo), accurately predicted, by the way, by the director at that time, Giuseppe Imbò. He had been responsible for adding the newest scientific tools at the observatory. The institution continues to keep abreast of the latest in geological monitoring techniques in order to prepare as best as possible for whatever dramatic events lie ahead.